The second class of lever also produces a mechanical advantage. In this lever the mechanical advantage is the ratio of the distance between the fulcrum and the applied force and the distance from the fulcrum to the resultant force, Figure 4.4. The same applied force is used to illustrate this lever. FIGURE 4.4. Example of class two lever. FIGURE 4.5. A two-wheeled dolly as a class two lever. For the class two lever the mechanical advantage will always be greater than one. In this case the mechanical advantage is 5 divided by 1 or 5. 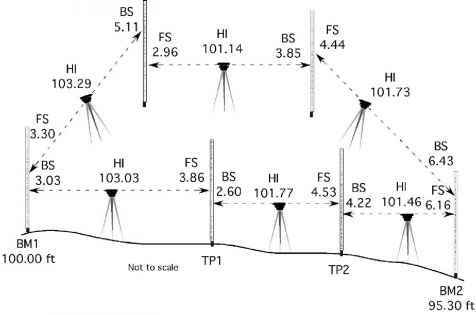 This is why a 700-lb load can be moved with only a force of 140 lb supporting the load at the end of the fulcrum. In the class two lever the distance moved and speed of movement also are proportional to the ratio of the lengths of the two arms. A common use of a class two lever is the wheelbarrow, Figure 4.5. It is important to remember that the determination of the class of lever is based on the location of the fulcrum, the length of the applied force arm and the length of the resultant force arm. If the relationship of these three components changes, the class of lever will change. A simple machine, like a two-wheeled dolly, can act as a class one or class two lever. 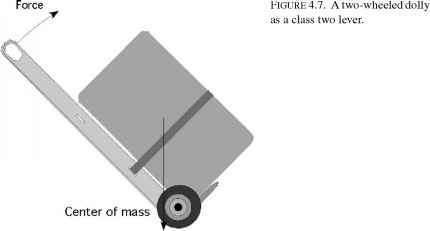 Figure 4.6 shows that when the center of the mass is to the right of the fulcrum (axle) the dolly acts as a class one lever. 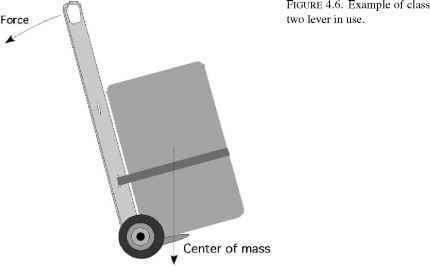 When the center of mass moves to the left of the fulcrum (axle) the dolly will behave as a class two lever, Figure 4.7. Also note that the direction of the force on the handle changes. When used as a class one lever, the operator must provide a constant pull on the handles. When used as a class two lever, the operator must lift up on the handles. The class three lever does not have a mechanical advantage. It is primarily used to increase speed and movement. The same applied force and distances are used to illustrate a class three lever, Figure 4.8. FIGURE 4.8. Example of class three lever. FIGURE 4.9. Class three lever with split measurement of length. As this example illustrates, the mechanical advantage for the third-class lever always will be less than one. Here 140 lb of applied force only can lift a weight of 28 lb. The distance moved and the speed of movement of the resultant point compared to the applied point is increased proportionally. It is important to remember that when all three levers are used, the two lengths, applied and resultant, are measured from the point of application to the fulcrum. In both the class two and three levers, the length of the applied arm or the resultant arm may be broken into two measurements, see Figure 4.9. In Figure 4.9, the length of the resultant arm is 5 ft because the distance is measured from the point of application to the fulcrum. A common use of the class three lever is the 3-point hitch on a tractor, Figure 4.10. Is a dolly a second class lever? How to calculate the weight of a 3point lever?